Look at this picture. I means JUST LOOK AT IT...! Mistress still difficult. We goes out for some yesterday and I gets lots of praising. But it's just make mistress ill tired again. We has just just had some hot tasty cheekun and vegitibb soup. Mistress like to eat some hot tasty soup. I steal the meatt and hers vegitabbls but only because I got there first. They were very tasty, hihihiiiii. Mistress still not feeling well so I am sorry and I will protect her always. Even from too hot tasty soup. And cheekuns. And dangerous vedgittiblls. Iss. If 1992 was Her Majesty the Queen's annus horibilus then 2017 was mine. Loss of a most beloved grandpa, loss of vehicular independence, further drastic loss of health and comfort... Awful. It is almost a miracle that we continue. My mistress has been confined to bed with appalling coughing, cold and fever. 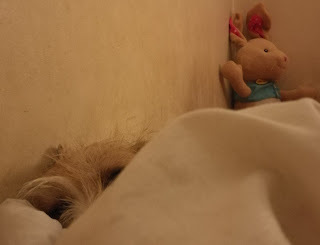 I returned this evening to find a usurper in my place that mistress and I formerly shared in OUR bed!!! On MY mattress, under MY duvet and blankets, atop MY bedsprings!!! I immediately tried to destroy him and slammed his head into the wall in jealous rage. He refused to fight back and continues with his idiot smile and wearing his silly blue jacket. 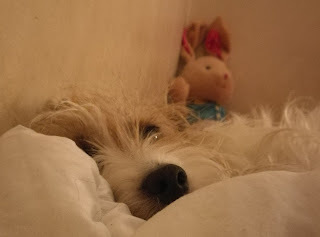 Mistress says that he is just a stuffed Peter Rabbit dolly that she was holding for comfort while I was away. But I'm not stupid. No. I am Gisele-Stephanie and this "Peter" will be very sorry indeed. OH NO! Someone tell me that I haven't been in neglecting the blog for THIS LONG?!? All evidence suggests that I have. I'm so sorry. I will try once again to rectify. Although I am quite cross. Do you know what I saw when I was out for my afternoon perambulation?!? Do you...? Blackberries in the hedgerow. IT'S JULY. BLACKBERRIES!!#! I am very cross indeed. As a nice, good (ummm... O.K., MOSTLY good dog...), I is getting bl😔😔dy sick of this. Why do you humans need to be keep killing each other? Unless you are starving, or unless they are cats, there's no excuse. NO EXCUSE. So stop it. Because, between the execrable Trump and all the other foul-minded "human" nutters, you will destroy me and us all. What did we dogs and other animals ever did to you that was SO bad that you had to take us all down with you? Mistress wouldn't like me to barks this, but I is GLAD that Jasper-Horatio Stafford didn't live to see these days. 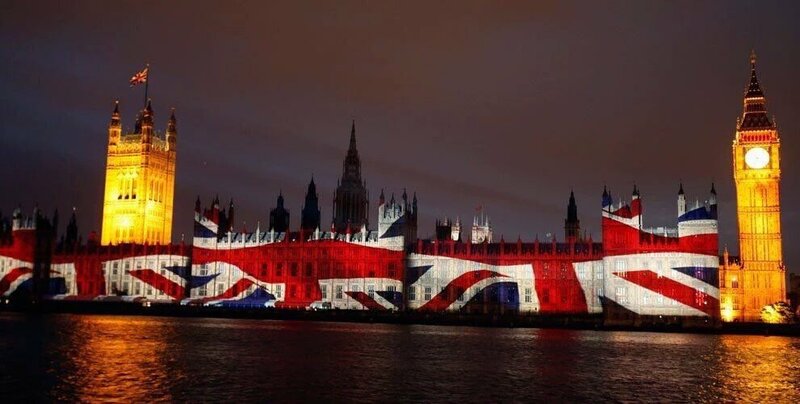 A cowardly and evil terrorist attack on innocent people and the Palace of Westminster, seat of my nation's government, today. A brave police officer and two civilians slain, along with the sick evildoer himself. Many lives forever ruined. But our spirit will not be broken. Not even if they cut us down to the last Parson Jack Russell Terrier standing.